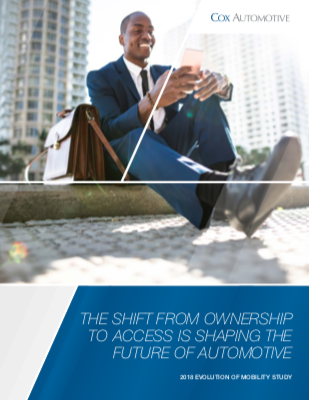 Shift from Ownership to Access Is Shaping the Future of Automotive - Cox Automotive Inc. While personal vehicle ownership is still prevalent, the perception that it is necessary is starting to dissipate as mobility alternatives emerge and the cost of ownership continues to rise. While vehicle subscription services are still new to the market, they present a promising alternative to traditional ownership by giving younger generations access to the latest technology, providing a low-maintenance alternative to older consumers, and offering consumers the ability to frequently swap vehicles. To remain competitive as mobility alternatives become more popular, dealers and OEMs can diversify their operations to create new profits centers with alternative transportation services. Acquiring new capabilities through partnerships to help successfully manage the integration of these models into the business will be critical to reducing the technological and logistical hurdles that cut into profits. 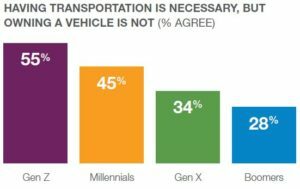 Awareness and usage of ride-hailing, car-sharing, and vehicle subscription services are growing, with nearly 4 in 10 consumers agreeing that transportation is necessary, but owning a vehicle is not. Collectively termed “mobility,” these disruptions to automotive retail are predicted to have a significant impact on consumer vehicle sales over the next five years.1 Dealers and OEMs must prepare for this change. Consumers increasingly feel that owning a vehicle is becoming too expensive. In fact, nearly half of consumers feel this way – up six percentage points over the last three years. As the costs of ownership continue to increase, these pressures are having the highest impact on Millennials and Gen Z, with over half saying that vehicle ownership has become too expensive – a significant increase since 2015. As the gap between household expenses relative to income continues to widen, pressure on consumer ability to afford vehicle ownership will create more demand for mobility alternatives. 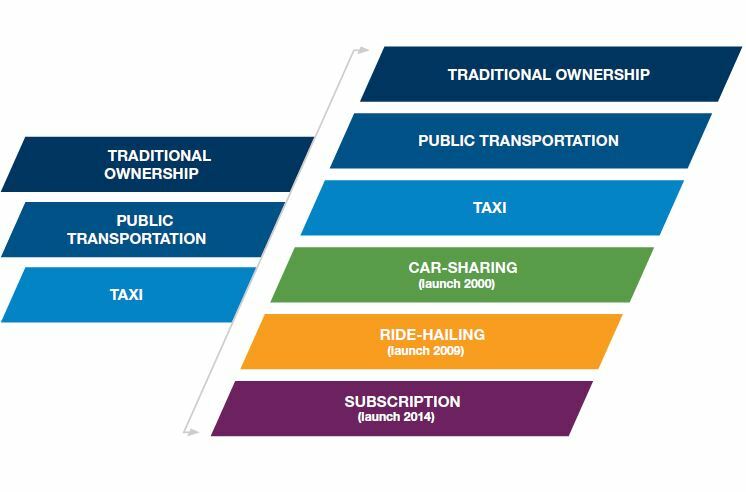 The traditional transportation model – comprised of vehicle ownership, taxis and public transportation – will expand to include mobility services that offer the ability to pay by usage, which will precipitate a fundamental shift in the market from vehicle ownership to “mobility as a service.” Consumer interest in car ownership will shift to a desire for mobility access. Ride-hailing services, like Uber and Lyft, are now mainstream – nearly 9 out of 10 consumers are aware of them and, in the last three years, nationwide usage of ride-hailing services has jumped 17 points to 39%. Car-sharing services, like Zipcar, were first introduced in 2000, nearly 20 years ago, and have been around twice as long as ride-hailing services. However, only 54% of consumers are aware of them and usage has remained fairly flat over the last three years. Car-sharing has potential to disrupt ownership but challenges such as availability and accessibility are barriers to consumer adoption. Compared to other modes of transportation like taxis, public transportation and ride-hailing, access to car-sharing is far more limited across urban, suburban and rural markets. Even in urban areas where car-sharing is most prominent, only 44% of consumers believe it is accessible, compared to 85% who believe ride-hailing is accessible. And unlike ride-hailing, which has grown across all generations, car-sharing services growth is limited primarily to Gen Z and Millennials. As more Gen Z consumers come of driving age, expect them to take advantage of this alternative ownership option, particularly given the financial costs that come with vehicle ownership. The competitive landscapes of the car-sharing and ride-hailing markets look significantly different. Nearly all ride-hailing consumers use Uber today, either on a standalone basis (45%) or in conjunction with Lyft (41%). Another 11% use Lyft on a standalone basis. Together, Uber and Lyft control 97% of the ride-hailing market, with Uber at 86% penetration of ride-hailing users and Lyft at 52%. Conversely, the car-sharing market (which has existed for much longer than the ride-hailing market) has more competitors, yet no one claims a majority of the market share. Zipcar, the car-sharing provider that was first to market, has the highest usage. However, there is a high degree of fragmentation among competitors. In fact, the top five competitors account for less than 50% of the market. The car-sharing market may present a significant opportunity for providers capable of addressing the challenges of this promising mobility solution. Subscription services were first introduced in 2014 with the launch of companies like Clutch and Flexdrive, and OEMs began to compete in this space in 2017. While vehicle subscription services have only existed for a limited time, research shows that this mobility solution is gaining traction among consumers – particularly those looking to forego traditional ownership. Already, 1 in 4 consumers are aware of vehicle subscription services. By comparison, just over half of consumers are aware of car-sharing services, which have existed for nearly 20 years. 1 in 10 surveyed consumers said they would opt for a subscription service2 over buying their next vehicle, which suggests that there is growing opportunity for this nascent mobility solution to disrupt vehicle ownership, particularly among Gen Z and Millennials. According to the research, the top benefits of car subscription services are: access to the latest technology, care-free maintenance, and flexibility/ability to drive a variety of vehicles. 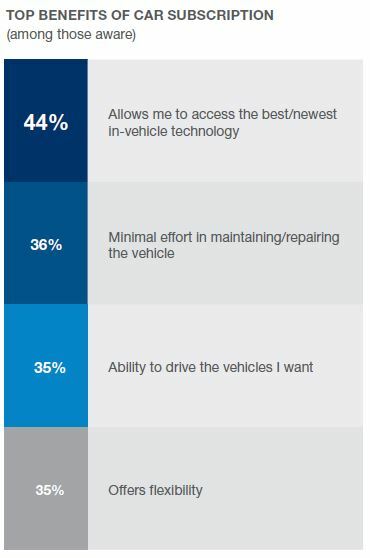 Gen X and Baby Boomers are more attracted by the subscription service benefit of “minimal effort in maintaining/repairing the vehicle.” The benefit of swapping out vehicles appeals to 1 in 4 consumers, particularly Millennials and Gen Z, with approximately one-third of those groups indicating they would prefer to drive a variety of vehicles. When asked which provider they would prefer to see offer subscription services, nearly half of consumers had no preference at all, and those that did were split equally between OEMs and dealers. Ride-hailing has not displaced vehicle ownership to the degree that car-sharing could, if its current awareness and accessibility challenges can be overcome. To remain competitive as mobility alternatives become more popular, dealers and OEMs can diversify their operations to create new profits centers with alternative transportation services. Acquiring new capabilities through partnerships to help successfully manage the integration of these models into the business will be critical to reducing the technological and logistical hurdles that cut into profits. For example, Clutch Technologies’ software platform enables dealers, OEMs and mobility companies to provide subscription services that create sustained consumer relationships and generate growth opportunities. Ride-Sharing/Hailing – Services where you pay for rides on a per-trip basis (e.g., Uber, Lyft). You can request a ride in a vehicle on demand using an app on a smartphone and a driver will pick you up and take you to your destination. This does not include traditional taxi or limo companies; your driver typically owns his/her own vehicle. Car-Sharing – Service where you pay by the hour (some by the minute or day) to use a car (some services also require a membership fee to access the service). Examples include Zipcar, Getaround and Car2Go. Pick-up/return of the vehicle is self-service from designated lots and each person who uses the vehicle keeps it clean and refills the tank with a provided gas card. Car Subscription – This service gives you possession of a vehicle (similar to leasing) and also offers the ability to swap your vehicle for something different on a weekly or monthly basis. Users pay a one-time membership fee and a subscription payment for vehicle access (either weekly or monthly) that includes all expenses except gas (e.g., insurance, maintenance, roadside assistance). Examples include Care by Volvo, Clutch and Flexdrive. 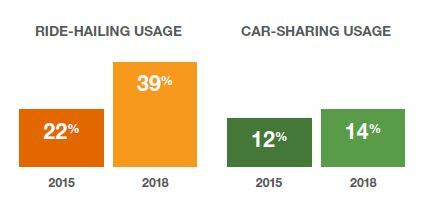 The 2018 Cox Automotive Evolution of Mobility Study surveyed 1250 consumers, 12 years in age and older, and compared the results to the similar Cox Automotive 2015 Ride & Car Sharing Trend Research Study which surveyed 2,464 consumers.